I keep falling off my blogging regimen these days and I put a lot of the blame on Instagram! I think I have wrote about this before, but it just rings so true it is hard to avoid. I wonder how many other people feel this way? For me, I get a lot more interaction on Instagram so it only makes sense to dedicate at more time there. However, the longer format of the blog gives more creative freedom, but at a cost, time. Time is my main enemy here, I find when I am going peddle to the metal on Instagram I don’t make time for WordPress and vice versa. Maybe time management is more of the issue here. If there was ever a time I should be ripping both full blast now is the time. During the winter in Calgary I find it too cold to go out much, so I am indoors more than I usually am. This extra time at home should give me the time to do both. So maybe I will start posting more again, I hope I will. I guess we’ll find out tomorrow haha. 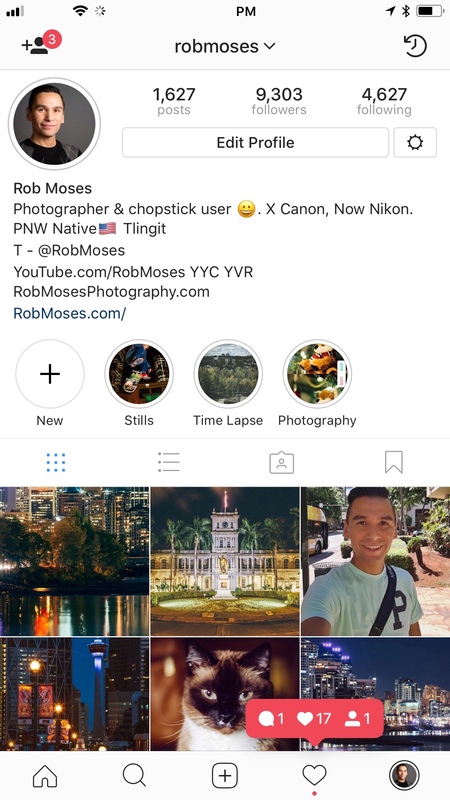 PS: Just incase your not following me on Instagram and want to, you can find me here @robmoses … If you want me to follow you back just DM me and I will :). This entry was posted in Personal, Random and tagged Alberta, blogging, Calgary, Canada, city, City Life, downtown, imac, Instagram, iPhone, iPhone 7 plus, mac, metro, Park, photo, Photographer, Photography, social media, street, time management, tower, Urban, wordpress, yyc. Bookmark the permalink. My son follows you on Instagram; he doesn’t do WP. I am just the opposite. We got you covered, Rob! Haha awesome! I need to do both though I think. Don’t worry about it! I love your pics… wherever, whenever! However, a wedding every so often should be on WP. I need to see weddings! I am on both platforms, I feel insta and wp serve different purposes. Insta is “insta” where I mostly post pictures and don’t expect much other than likes. And most of the likes I see on insta are routine likes and very few real chit chat. Yes, insta has a story and the messaging which makes it multi-purpose.. WordPress, on the other hand, is for a more detailed talk. Yes, WP posts take lot of time to prepare and post. I try to post things same time on both platforms that way content is ready. Agreed! And I need to get both going at the same time also, I think that’s the best way to get it done. I think both Instagram and WordPress have their purpose, as you said, instagram is great for it’s immediacy, while WordPress gives you a longer format to explore topics and it takes time to develop those posts. I have also found more and more of the photographers I use to follow on WordPress are turning to instagram, so I go there to find out what they are up to. we only have so much time in the day and we have to decide where we get the most reward for our time. I totally agree and your absolutely right about time. Especially when you toss a family with little kids in the mix, time becomes an even more valuable commodity. I agree… I find that i get more interaction on google plus with my photography/poetry, however I wanted a place where I can remain annon. I started out in G+ under my real name, I have over 20K followers, many which know me personally. WordPress is different indeed but it does allow me to express myself in ways that I do not fear of beaing judged because no-one knows me here. So it’s nice. Time is also something I tend to no have enough of as well. Yes, thank you! I’ve been having this same discussion with a few of my own followers, tho in my case I concentrate more on ‘Bookstagrams’ than Instagrams. I’ve discovered many of my WP people also do the same and love their photos as much as yours. I may reblog this on the weekend, with your permission. It’s definitely a conundrum, but I noticed activity on my “grams” and they are so much fun–spend WAY too much time at it. Congrats on your follower numbers, well deserved! Oh well thank you very much and yes please do share all you like :). I have the opposite conundrum; I opened an Instragram account ages ago, but I always have things to SAY, and (since I’m a writer, first, not a pro photographer) one has to prioritize. Thanks for the perspective, and thanks for the like on Under Western Skies. Happy shooting.